Center Franco Barroso (207-C-94) had a very impressive game in the last round for Echague, receiving a Interperformances La Liga Argentina Player of the Week award for round 35. The 24-year old player had a double-double of 16 points and 19 rebounds, while his team edged out Obera TC (#7, 11-15) 89-86. Thanks to this victory Echague moved-up to the 4th position in their group in Argentinian La Liga Argentina. Too late to salvage the team, which is currently ranked such low. They already lost 22 games and recorded just four victories. Barroso has many years of experience at Echague, through which he has constantly improved. Franco Barroso averages this season 8.7ppg and 6.9rpg. The second best player in last round's games was 26-year old American Paul Larsen (198-F-92) of ECHAGUE. Larsen had a very good evening with a double-double of 19 points and 13 rebounds. Bad luck as Echague was edged by the lower-ranked Villa San Martin (#14, 16-10) 80-76. This loss caused Echague to drop to 4th position in North. 22 lost games are too many comparing to just four victories Echague managed to get this year. Larsen is one of the most experienced players at Echague and has a reputation of one of team's most reliable players. Third on the list of top players last round was forward Lisandro Rasio (198-PF-90, agency: Pro Sports) of Salta Basket (#9). 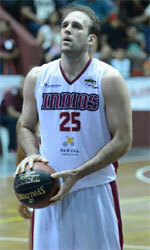 Rasio scored 22 points and grabbed fourteen rebounds (!!!). Despite Rasio's great performance Salta Basket lost 72-75 to the lower-ranked Union SF (#13, 15-11). But his team cannot count on just a single player as he also needs help of the other teammates. The last thing Salta Basket needs is to lose another game like this one. They lose more and more distance to the top teams in North. Their record is 16 victories and 10 lost games. Rasio has a great season in Argentina. After 33 games, he made it on the list of the league's leaders in points with 18.5ppg (3rd best) and rebounds with 11.4rpg (2nd best).